Unreal Lawns supply and install artificial grass in Radcliffe and the north west of England. We serve domestic and commercial customers in the area, with products suitable for a wide range of applications from outdoor spaces and gardens, to event areas, exhibition space and more. See below for some examples of projects we've carried out in the Radcliffe area. Unreal Lawns transformed a lovely little garden in Radcliffe, Manchester using Supreme 38mm artificial grass and we are thrilled with the result. By installing this artificial lawn we have renovated the garden with a speedy facelift; tidying up the appearance of the lawn and adding a splash of brightness and healthy colour, which will last all year round. Why put up with wilting, brown, overgrown grass in the winter when you can have a healthy attractive lawn every season? 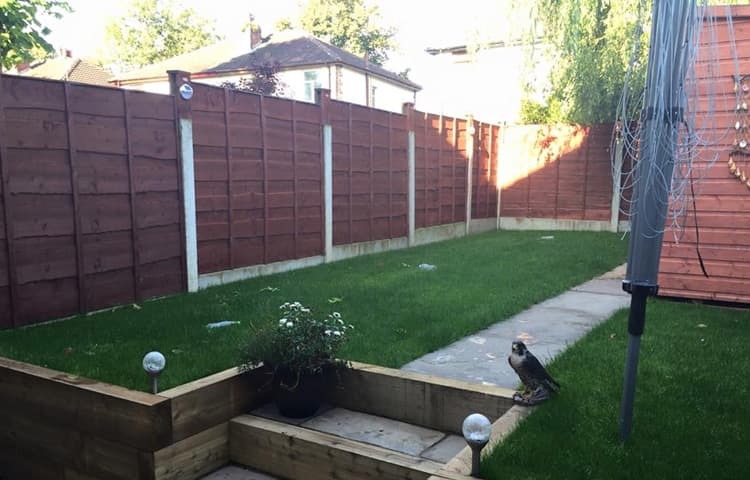 You can see by just looking at the before and after photos, how much this property has benefited from the decision to invest in an artificial lawn. The lawn was installed by our experts who always ensure every job is carried out efficiently and finished at the highest quality. With an artificial lawn you will never again have to worry about your dog walking muddy paw prints through the house, or clean up those frustrating muddy grass stains when the little ones (or big ones) have been out playing football! We are thrilled to say the residents now have a garden they can spend quality time in; having dinner al fresco style, kicking the football around or snuggling up with a hot mulled wine under a blanket on a cold winters evening.